Water temperature is vital. Doing it correctly, you can make what many say is the perfect cup of coffee. Ideally, you want the temperature between 195 and 200 degrees F. One way to do this is to boil the water and use an instant read thermometer from any kitchen store. Once you remove the water from the heat, see how long it takes to reach 200 degrees. It will probably be just 10 or 15 seconds. In some places, your water may boil at the proper temperature (higher elevations). Do not allow the water to boil more than a couple of seconds. Once you know the timing, you are all set for the future. Pour, add your sugar and cream if you must, and enjoy. Dont let the coffee sit in the pot, it will actually keep brewing. Also, be aware, there will be some grinds in the bottom of your cup, it is best not to go for the last drop! 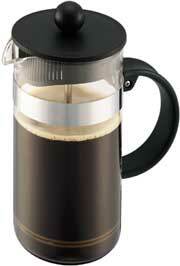 Making coffee with the french press is both easy and fun. You can start it in the kitchen and move the pot during the brew time to the table so all can wonder at the miracle of coffee brewing. Because you have total control over the brewing environment (e.g. : water temperature, brew time, grind type), you can certainly add your own touch to every cup you make.